On January 20th a new journey began for my wife Nancy and me. It will be an arduous course with challenges that will test our will, our faith and our strength. 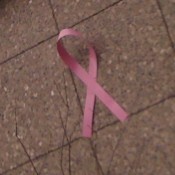 It began on December 22, 2009 when we learned she had breast cancer once again. Her first bout was eleven years ago and she endured that experience on her own. Now that I am in her life, we will take on this rascal together. 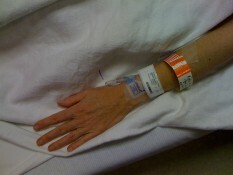 Nan had surgery early on the morning of the 20th. She joined forces with Dr. Joyce Haun, a Denver Kaiser-Permanente surgeon. They are two strong, dynamic women, who I believe given the opportunity, could tackle any darn thing nearly single-handed. My wife is a genuine, determined, principled and a caring individual but often times private. She wasn’t particularly thrilled when I told her I wanted to discuss and document our journey. The day before the surgery she made it perfectly clear,”No cameras”! When she discovered I was taking some candid shots with my iPhone camera early the morning of surgery, she gave me the evil look but I wanted her to know I was doing it from my perspective as a husband and supporter, hoping that the endeavor might be a help to others. It also was, I guess in someways, a distraction for me. Something to keep me busy. Since the tumor was aggressive (infiltrating ductal carcinoma), going into to new uncharted waters was a bit unsettling to say the least. Before meeting with Dr. Haun we discussed many issues, did some online research and set out on our own pragmatic course. There are times in our lives when things unfold in a very deliberate way. I think Dr. Haun was our lucky charm. 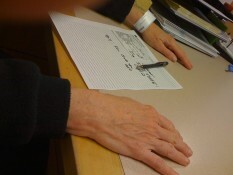 We met Dr. Haun on January 12th and within minutes we individually could tell she was our guiding light. What was special about her was her straight forward talk of the circumstances we would face, options to attack this dastardly beast, and the great possibilities that lie ahead. She didn’t beat around the bush but she also had a calming and reassuring way about herself. She readily admitted she didn’t have all the answers right away but displayed confidence she would be able to lead us in the right direction while offering her expertise and guidance. All this with an upbeat demeanor, compassion and a sense of humor that would give Letterman a run for his money. In short she is a jewel. Surgery day was a long one as anyone would expect. We left the house at o’ dark thirty and Nancy was in Kaiser’s radiology department at 6:30 a.m. for imaging dye. 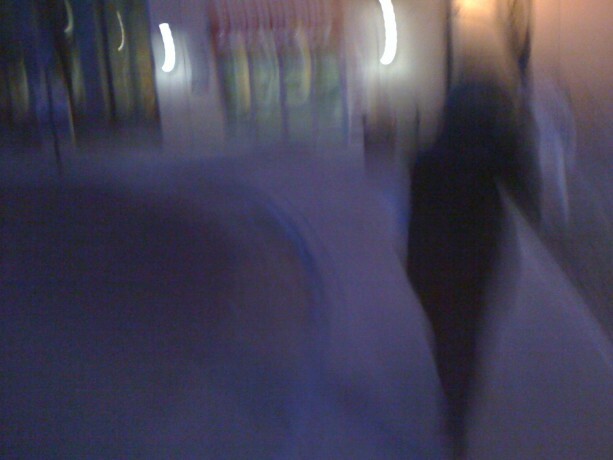 Then we shuffled a stone’s throw away to St. Joseph’s Hospital for her pre- op. I kidded with people they wanted to have her in the operating room while she was still asleep so she didn’t know what hit her! Surgery wasn’t a cake walk for Nancy but things went without a hitch. 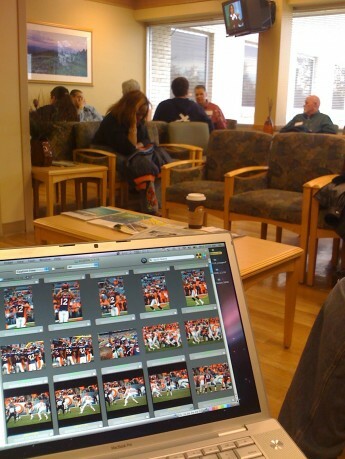 Dr.Haun and her staff kept me posted by calling the waiting room on various steps of the procedures. That was a very comforting and satisfying gesture. Because the of the lengthy time and detail of the mastectomy, I decided to grab lunch across the street with my sister who was so kind to come and sit in with me while the operation continued. 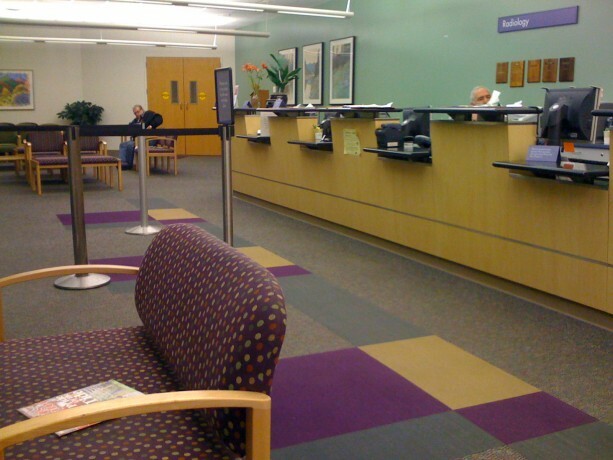 Normally, I probably wouldn’t have budged from the waiting room but I felt so confident in Dr. Haun and her team I felt the small break would be good for me since I had been on task for over six hours.I was told I had about an hour and half before she would be settled in her room. Wrong! Just as my sis and I ordered lunch, the waiting room volunteer called my cellphone and said Nancy was on her way to her room. A leisurely lunch became a quick bite and off we went to see Nancy. I didn’t know what to expect and I certainly wasn’t sure what kind of shape my sidekick would be in after such an ordeal. Surprisingly, Nancy looked terrific! A little groggy and struggling with a slight sore throat from the intubation. But, hey who wouldn’t be complaining about an apparatus being shoved down your throat! She was already upright and partaking in a liquid lunch. She was a real trooper and I was very relieved. 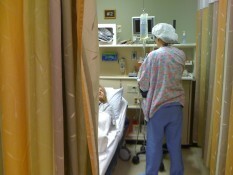 Dr. Haun visited during her rounds late that afternoon. She was exuberant and extremely sweet in her discussions with Nancy. We knew from an examination during the operation that her Sentinel node reported no signs of cancer. Dr. Haun assured us she would let us know as soon as possible what the status of the other lymph nodes reported in the days to follow. The highlight of the afternoon was when Dr. Haun asked Nancy if she had any questions. Nancy’s query was, ” Will I be able to go to Las Vegas with my friend Brigette the 13th of February?” Honest truth. I was chuckling inside because I knew right then and there Nancy had her own agenda on her recovery route. It’s an annual trip she and her friend take in February. The doctor thought that might be a little premature and wasn’t sure what Nancy’s post op treatment would be quite yet. She kidded Nan and said if chemotherapy was involved and she lost her hair, she could easily go as Tina Turner one night and choose a another celebrity hairdo the next. Nancy was slightly amused. Nancy could have gone home that evening but Dr. Haun thought a precautionary overnight stay might be best since my wife tends to get nauseated with most pain medicines. The weird thing about that is Nancy never did take pain meds! So, when I came to pick her up the following morning, not only was she dressed ( in a very becoming warm up suit, I might add) and raring to go, she walked right out of the hospital. I was floored. 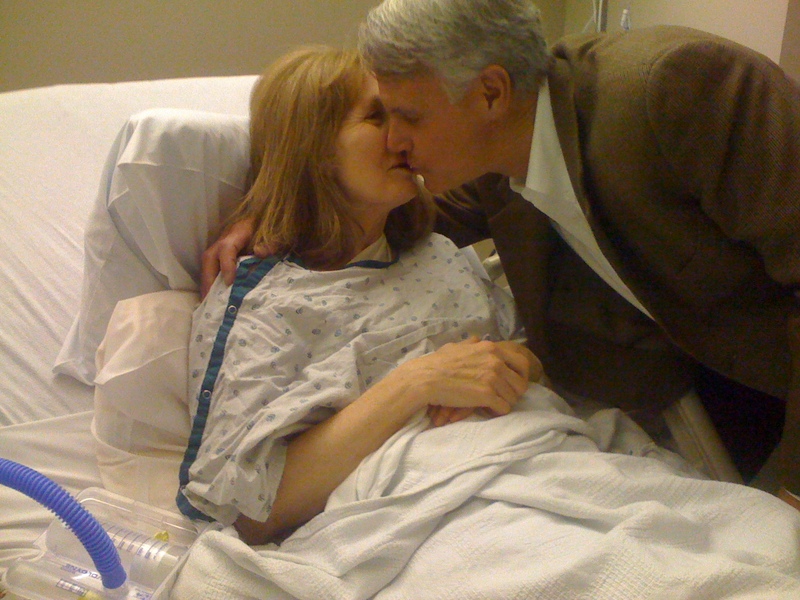 As a husband and a prepared caregiver I made sure everything was in place when she came home to convalesce. Wait, the day before surgery Nancy was cleaning at home like a maniac though I did help with some of the chores. At any rate, we planned for various types of light foods and drinks. Her bedding was freshly cleaned and I charged up my “walkie-talkies” so we could communicate from various locales in the house. Within an hour of Nancy settling in for some quiet time the phone began to ring. Friends, family and professional associates were on the horn offering love, support and prayers. Nancy decided that day to catch up on her email as well, which also was inundated with electronic well wishes.Then the flowers and food began to flow into our home. We could have started a small bistro with flowers for every table! Our home smells of spring and Martha Stewart’s kitchen! The day of surgery her long time friend Marge equipped me with a mini cooler brimming with containers of homemade “Jewish chicken soup”. That she said, ” was to hold us over until she orchestrated meals from Nancy’s friends and professional peers. Topping that with incredible dishes from our Evergreen area neighbors and friends, Nancy said her biggest fear was blowing up like a blimp. It has been nearly a week since her surgery.She looks beautiful and her strength is pretty much back. She has been on a couple small hikes with the dogs, managed emails and phone calls and is determined to get as many thank you cards in the mail as humanly possible. Her will, determination, attitude and resolve are sound. Along with those same objectives, I am concerned but very optimistic. The journey is long with some hidden curves but we are on the right path. The wonderful light illuminating that path is shining from all of Nancy’s friends, our families and those that have entered our lives in so many different ways. The Kaiser Permanente radiology department was a bit eerie in the pre dawn hour. The good news was there were no lines. Paper work. Need I say more? 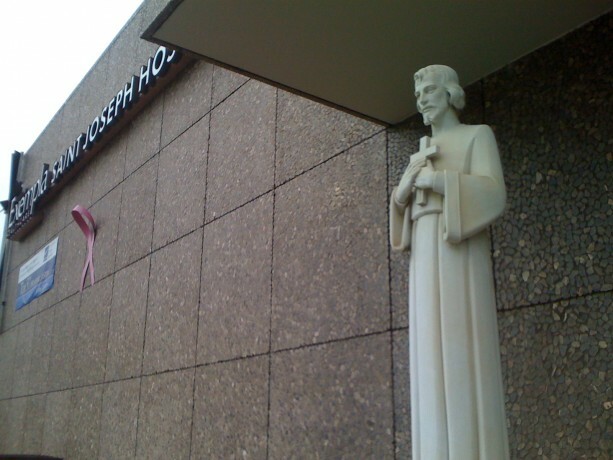 A pink ribbon and a statue of Christ. Not bad icons to have outside the building of your operating room. The waiting room was spacious and comfortable...not the Ritz Carlton lobby mind you, but it was a good place to relax and get some editing done and keep me preoccupied. 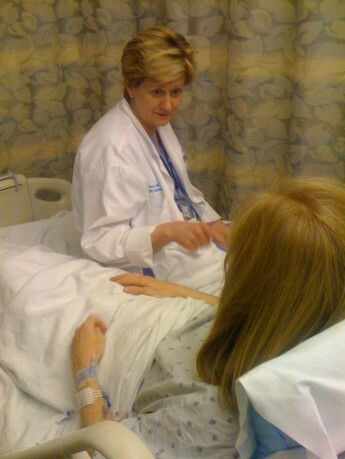 Nancy's surgeon Dr. Joyce Haun, a physician who upholds the ultimate credo of "bedside manner", gave Nancy a thorough briefing the afternoon following surgery. Once Dr. Haun became aware of my photo essay she had to get in on the act and insisted I kiss Nancy!